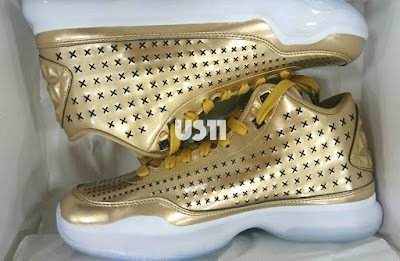 Nike Kobe 10 EXT Mid "Liquid Gold"
With the Kobe X able to transition well to Nike's EXT line, here is one shoe where you don't want to crease if you have them. Dubbed as "Liquid Gold", this Nike Kobe 10 EXT features a mid-cut profile with smooth gold-colored upper and laces. The "X" pattern cutout's represents Kobe's 10th signature shoe with the swoosh brand. To make things more elegant, an icy midsole and translucent outsole for a complete luxurious look. These are so nice, that you would just like to put them in a nice case and never use them forever. But then again, these are shoes and are meant to be worn. The shoe drops on November 6, 2015 and probably would run in limited quantities for sure so good luck if you are planning to hunt for a pair.